I see that when changing materials the hotend temps (default printing temp) is not updating. Also I see there is no link icon like the build plate temp if that is an indicator of something. Can you be more specific? Do you mean when you switch to ABS the default temp stays at 210C in cura? When I switch to any material the temp stays at 210C or what ever the last temp was. So is this intended behavior or is it a bug that needs to be submitted somewhere? If intended I am curious why. So I'm using cura 3.1 right now and it's on pla and temp 200C for um3. I switch to ABS and it asks if I want to "keep or discard" the changes. If you select "keep" and if you had set the temp manually then it will keep the 200C as is and not change it. Maybe that's your issue? You click "keep"? But if I select "discard" it changes the temperature to 230C. I don't see any bugs. What happens for me is I have it set to a PETG material I created with the temps I use. It didn't change the temp to what I set so I change the temps manually. When I switch to a PLA material I also created it does ask if I want to keep or discard the changes that I set manually that didn't change last time I switched materials. I click discard and it changes to the PLA settings. Seems like what you describe. Then I immediately change back to the PETG material without making any manual changes and while the build plate temp changes the printer temps don't change and it doesn't ask to keep or discard any changes. Any suggestions for this or is it a bug? What you set in the sidebar, always trumps what is set in the material. The same goes for what is set in a profile. If the profile sets the temperature to 210, then that is what will be used over what you set in the material. Then why even have material settings if they never change what is on the sidebar? That seems like a lot of wasted work on both the programmer and the user if changing materials doesn't change the temp to the preferred setting. This also doesn't sound correct since it will change the print bed temp just not the hot end temp. What am I missing here? 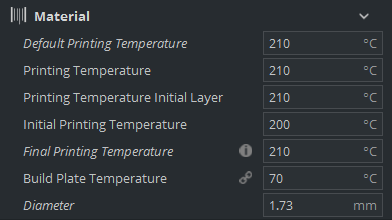 Or how do I remove the hotend temp from the profile so it will use the material temp instead? Then why even have material settings if they never change what is on the sidebar? That is not what I said. If there is no Printing Temperature set in the profile, then the temperature from the materials pane should be used. it will change the print bed temp just not the hot end temp. What am I missing here? Probably because there is a hot end temperature in the profile, but not a bed temperature. 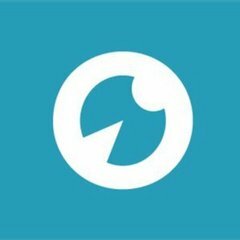 Unfortunately once a setting is in a profile there is no easy way to get it out (other than switching to another profile that does not have a temperature in it). That is an oversight in Cura, and I hope I have time to fix it in a future version. If you want to keep your profile and only want to remove the temperature from it, you have to go into the configuration folder and edit the ini profile file (there is probably a line that says "material_print_temperature = 210"). That's not a pretty method, but the only method I have. This should be considered a bug. If I change materials and have gone to the trouble of entering temperatures for my materials, of course I want it to use the temperature I set for each different material. I definitely don't want to be printing PETG at 200C which is what nearly happened, and why I'm searching for answers right now.